I have always wanted Adirondack chairs along the lake. So we took the challenge and built an Adirondack chair for each family member and now have Adirondack Chair Plans for you! The outdoor chairs not only enhanced our backyard, but they also created a fun family activity and a great space for us to relax as a family for years to come! The Adirondack design is a perfect style for outdoor furniture, and they go together quite easily. 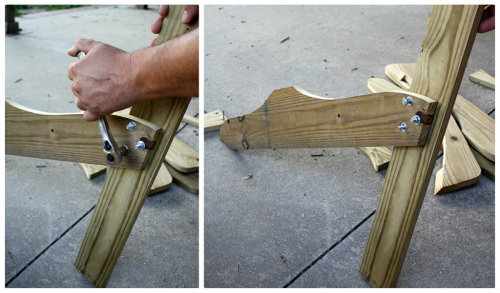 This DIY Adirondack chair is a great way to get the whole family building with a comfortable seat as their reward! The instructions for the Adirondack chair plans are simple to follow. 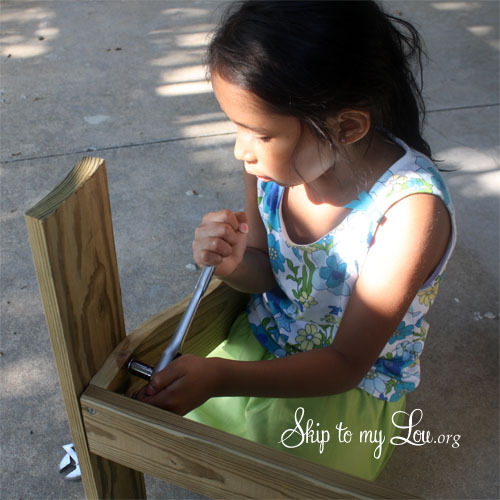 Even our young daughter was able to help out and participate in the building of her own chair! First, download the Adirondack chair plans. The template is actual size so you will have to have it printed on 24″ by 36″ paper at a local copy shop. Many copy shops will allow you to email the file to be printed. Then all you have to do is trace around the pieces, no measuring! Super easy! Download the Free Adirondack Template, gather the supplies and you are ready to build. Lay all templates out before cutting, carefully placing to get the most pieces from one board. Trace, cut and sand. Bolt legs together with 2 inch carriage bolts. Once legs are assembled, screw the front cross piece between the front legs. Screw the bottom support to the back legs. Screw arm supports to the side of each front leg. 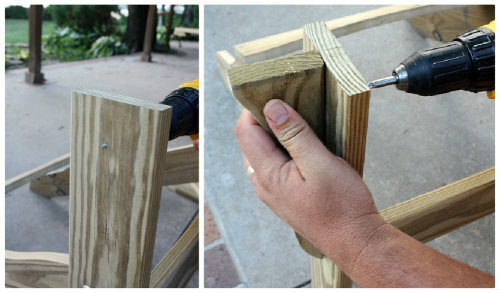 For the entire chair, drill pilot holes to keep the wood from splitting. Screw on arms of chair onto the front legs. Again drill pilot holes and then bolt on back support piece. Screw middle back piece on chair. Make sure both arms and vertical back piece are level before attaching. Screw on next two back pieces. 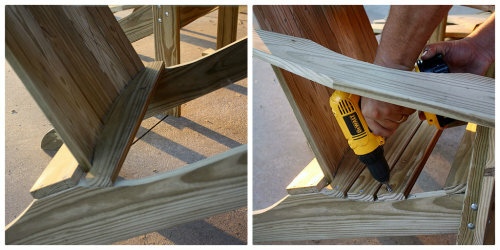 You want the slats to be spaced evenly, making sure to keep arms level. Evenly screw on remaining back pieces. An amazing and comfortable Adirondack chair! We considered painting the chairs, but in the end, we decided the natural wood look was too beautiful to change. 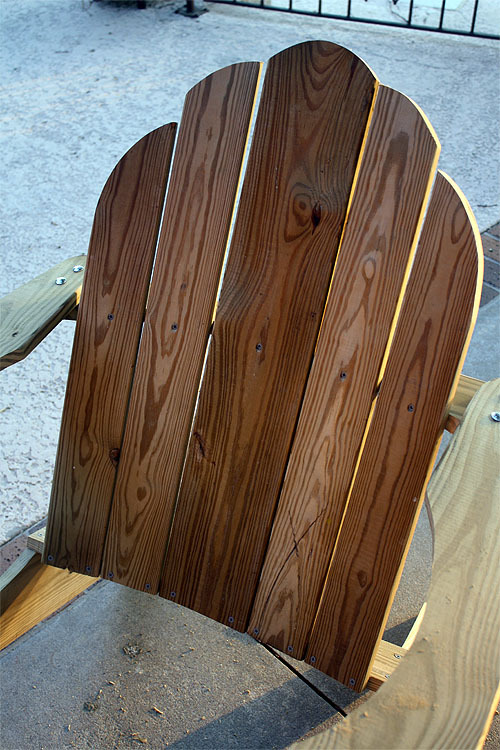 The Adirondack chair design first made the scene in the early 1900’s. The designer, Thomas Lee, wanted a comfortable chair for his cottage on Lake Champlain near the Adirondack mountain range in upstate New York. This iconic piece of outdoor furniture may have grown in popularity amongst the east coast cottages, but it is now a must have piece of patio furniture for summer enjoyment coast to coast! The comfortable design summons you to sit down and rest. The wide armrests and the slanted back with a gentle recline help the weight of your day disappear. The design is so comfortable that even cushions are not needed. You can line these chairs up and face the lake to watch the sunset or create a friendly space for friends and neighbors on the patio. Circle the chairs up around the fire-pit and enjoy an evening cocktail or a warm s’more, laugh, and tell some stories. The Adirondack chair style is perfect for any outdoor space that you want to feel comfortable and inviting! 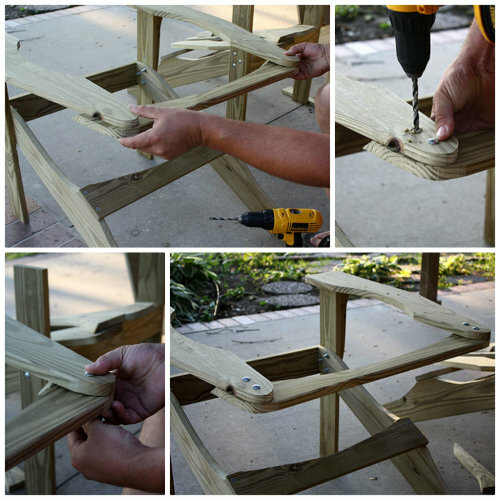 I encourage you to give this outdoor seating project a try. Gather up the supplies and round up the family. You could order the chairs online and pay the hefty shipping fees, but you would miss out on a great opportunity for the family to not only create memories but also create a fun place where you relax and enjoy each other’s company! The easiest thing to do is print of the actual size template at your local copy shop for the Adirondack Chair Plans here. If you want dimensions, we have done our best to recreate them for you. Click the link below. Disclosure, Lowe’s provided me with a gift card for supplies. Rick Ladouceur, can you please post some pictures of the love seats you made. Thank you! Yes Rick! We would love to see. You can send me a picture and I can upload. Thanks so much! I have made 28 of these chairs now for friends and family. I use western red cedar stained and they look awesome. The first chair I did was a as a test using economy grade 1x6 spruce and 4 years later & outside in a Canadian winter the chair still looks great as well. I did extend the back boards 4 inches and made another curved back piece that runs across the top, at the back, to minimize warping. I position the arms 1 inch in front to the leg piece and this moves the back rest slightly ahead, the angle is such that it is easier for elderly folks to get back out of the chair (me). Cutting the 30 degree angles is a challenge, I have tried band saws, scroll saws and jig saws. A good quality jigsaw with new blades works best for me. It takes some sanding after to remove cut marks. I also router all edges which helps to smooth the lines out as well. I have also made a couple of love seats (2 chairs joined together) by extending the very front board across the two chairs and adding a board across the two sets of legs in behind the back pieces, then build a table attached to the bottom of the arms that closes the gap between the two chairs. I am going to try this pattern for around our pool! I was wondering why you used carriage bolts rather than countersunk (if that's a word) screws? I don't really like the look of the bolt heads showing. Do you think wood screws would be strong enough? I would like to see a settee/loveseat printable done like this with a table in the center. I imagine the long front and back pieces would have to be printed as a mirror image, so that when cut out you would trace out the piece then flip it to get the full length. 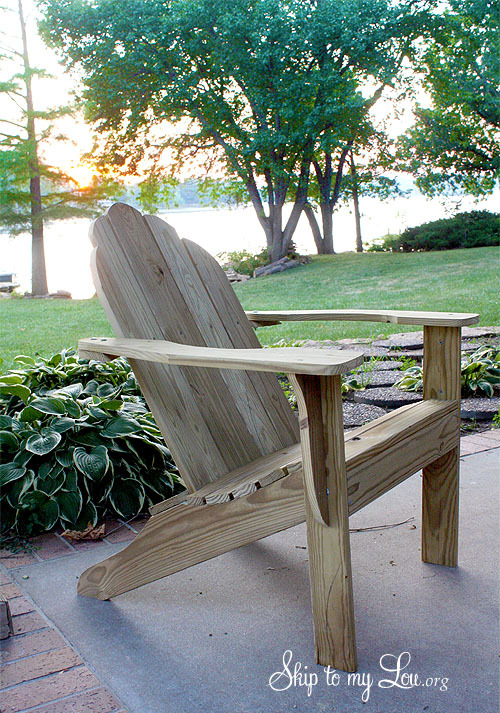 I built a single adirondack chair like the one shown and my parents really liked it, but I think the settee would really be neat for them,but they both would need armrests of matching height to get out of the chair. They are both in their 80s. Just curious... is this actual 1 x 6 or is it true deck lumber 5/4 x 6. The reason I ask is because deck lumber is 1" thick unlike 1 x 6 which is actually .75" thick. Hi Ken, It is the 5/4"
Comment #121... Brett was CORRECT! You can actually print it out yourself. Save the PDF, open it in Adobe REader and print it out using POSTER MODE. I didn't see "POSTER MODE" and kept trying to print it..DUH. Thanks Corrine and Brett! I haven't tried that. I would be greatful to know how to go about cutting the 30 degree angle. What sort of tool is best here? Jennifer we cut it with a scroll saw....but a band saw or jig saw would work. Trace the pan onto the wood and it will help you cut it. Hope this helps. Don't hesitate to ask for more help. i want the chair to be bar height. What adjustments do I need to make? Hey guys. I just made this chair with my father, using this plan. Here's a time lapse video of us making it. Hope you like it! Ricardo this is fabulous! Great video! Thank you for the information with regard to making this great project. I made one chair and then decided to make an additional chair for my wife. Then, not surprisingly, our two children wanted one as well. However, the templates really save time. Thanks again for posting the information. Dears, THANKS a lot for the plans, I built two of them, they look great! I guess these are the first ones on Argentina coming from your plans ;-) Yes, they are standing in my backyard in Buenos Aires, looking just great! Since we use metrical system, I had to prepare a conversion table to make sure all dimensions were ok. To print it out in big size, I used the Acrobat feature to print out a poster and then I glued them together. It worke perfectly well! Thanks again, if you want a Picture hos they look like, let me know! Are all the cuts made using a band saw and a table saw? We used a scroll saw instead of a band saw but a band saw or jig saw would work. Whatever you are most comfortable with. We also used the table saw. Are these chairs stackable? Looking for a way to store them in the winter when they are not in use. at a 30° angle" - am I correct in assuming that the template shape represents the upper surface of this board, and as a result of the angle of the cut, the lower surface will be slightly wider? I like your site! Thanks for the chair has drawing! I emailed the file to a local copy center and they stated that they could not print it out for me because it is copyright protected. How do I get around this issue? FYI, if you save the PDF, then open it in Adobe Reader, you can print in poster mode and it will print it out to several pieces of paper. Then you just tape your papers out and make a real template out of poster board or cardboard. Wow, I should have had the templates made. I just used the drawings and cut out pilots to mark with. Then I noticed that not only were the 1st seat piece and back assymetrical, but no way were the back boards going to fit the upper back rest! Had to redesign and recut these to work. This was my first attempt at building an Adirondack chair and let me say it was an absolute pleasure to build.Thank you for taking the time to put this together. I went down to the local office Depot..pulled up your website on their computer..and had it printed out on a 24"by 36" sheet of paper and it worked out perfectly. Cost me under 5$ to print out. The only issues I had were the 30 degree angle cuts,and that's more operator error as I'm using a jigsaw, and trying to figure out where to screw in the arm rests. Mine ended up about two inches in front of the legs and it worked out perfectly. I planned on making a total of six so I cut the templates out of sturdy cardboard to make them easier to trace and after that it was a breeze. The fist chair was done in under 6 hours. Within the next 2 days I made 5 more. Thanks again. I had a bad experience making an Adirondack chair about 12 yrs ago. Recently, we acquired a Summer home and I wanted to try again. After a lot of searching I found your plans. I made one and had some issues with the angle cuts for the bottom seat back slat. Everything else went quite well. I increase the length of the back slats by 2" as someone suggested. Made 1/4" templates and then made three more. The response from almost everyone that sits in them is that they are just so comfortable. My wife sat in one for over two hours with no cushions and was just amazed. I do have a shopsmith with a bandsaw plus various sanding attachments which helped a lot. I used pine that I had from a previous undone project. The stainless steel deck screws come in 1 5/8" length and that is not a problem but the plans call for 1 1/2". Stained with Thonpson's Semi transparent wood proofing stain, Harvest Gold. It looks great. Tried to post a pix of the four of them but can not figure out how to do it on here. Thanks you for these plans. Very happy with the results. I got mine printed at Office Depot without any difficulty. Sorry, I just do not understand how something greater than 2 ft long will fit on a peice of paper only two feet wide. I have been on the phone with Kinkos for twenty minutes and it is a scaling nightmare. Okay, I love this design. I printed the templates yesterday and built one last night. It cost $34 for the lumber and hardware and I spent 3.5 hours from tracing the templates to sitting in my new chair. I plan on building one more after work today. Thank you for posting this great, simple design. I will be building matching foot rests and a table tomorrow. I would be happy to share my design when complete. Again, thanks for posting this! 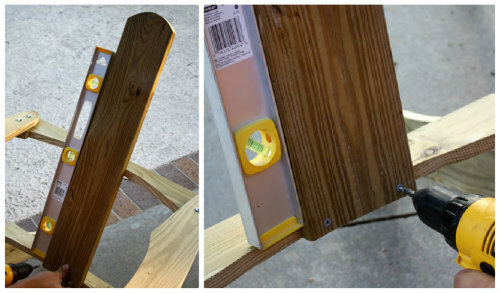 Download the first pdf called "Adriondack-Chair-Template-2012.pdf" for printing.. The second pdf is just showing dimensions and does not print to scale. Found this out the hard way! Hmm, tried getting these printed out at Staples (UK) and they come out half sized. Also tried using tiled printing at work, same thing. Have the plans changed? Thanks for the effort.. Awesome plans, thank you for making them available. A local store was having a sale on pressure treated wood and my first chair was made with less than $10 in supplies and a little effort! Thanks again! i need help, i want to make this but once i send it to the print shop, how do i trace them onto the wood? do i need to cut them out individually? im confused? 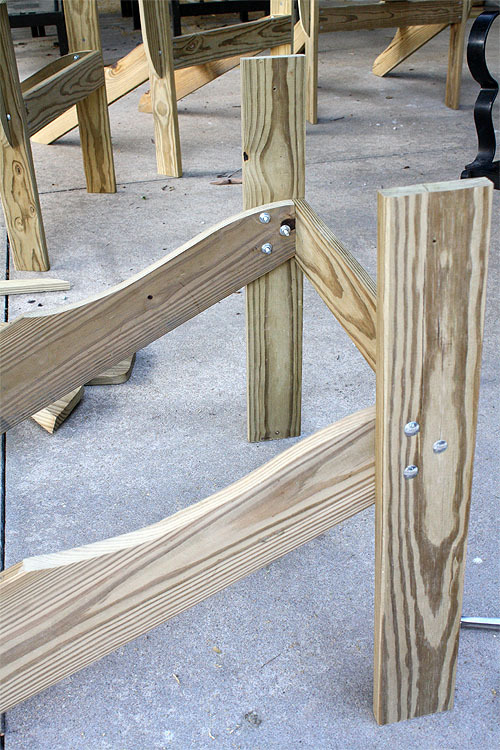 help, i need to make this for a carpentry class. I just made 2 of these chairs and your templates made them super easy to make . Thank you very much for the templates! !You Rock!! Thanks Ian! Stay tuned we have some more fun Adirondack chair ideas coming! Has anyone added wood to make it into a rocking chair? Thanks for the plans! My wife and I built two over the past weekend and they look great stained. They really complete the backyard and make a great date! Do you have plans available for cup holders? I think i need multiple per chair. Possibly one that holds margarita glasses? 1 – 10 ft 1 x 4 treated lumber (cut all four of the remaining back of chair)"
Based on the photo of your finished chair, you have 5 seat pieces and yet on your cut list, you only reference 3 (1 coming from a 12' 1" x 6" and the other 2 coming from the other 12' 1" x 6".) Where do you propose the other 2 seat pieces come from? Your help is much appreciated. Just wanted to let you know that I just completed 6 of these for sitting around my firepit. They are outstanding! Great plan and the templates worked great! The only difficulty I had that I never found in the plan is where to place the front of the arm over the front leg. I suspect I pulled it too far forward because my 30 degree cut was off on the back. Regardless, the chairs are outstanding and they are bringing rave reviews! Thanks for publishing!! Can you provide me with dimensions for a child-size chair.... want to make one for my grand nephew who is 2 years old. Perhaps it is just a percentage of the adult dimensions... like 75% (leg would be 1'11.75"). How can I make the 30* angle cut on first seat board I am thinking with job saw?? Anyone??? My husband said he did it with jig saw. He adjusted it to 30 degrees and followed the line. I hope this helps. Let us know if you have more questions. I brought the pdf to an insty-prints place and they wanted $60. At any rate open the pdf document , choose print then under page sizing & handling click on poster, then print. You will have to assemble and tape all the pages (24) but this should work for most. Hi Chris, if you email the file to a local copy center like Office Max or Kinkos they will print it out on 24" x 36" paper. All the pieces will be just the right size to trace around and cut out. Our copy center charged me about $6.00. The orientation on these plans do not allow you to print in actual size. I had these printed on 24 x 36 and they are far too small. There is no way you can make this fit on 2 pages. The PDF needs to be turned into 4 pages and rotated to landscape and printed 48" wide x 24" tall or all the templates are miniature. How in the world are people getting their templates correct? I liked the plans so I decided to make a few for my grandkids (between ages 2 and 5). I had the file reduced to 25.2" X 16.8" (70% of the original 36"x24"). That doesn't seem like a big change but trust me, it is a lot when you think 3 dimensionally. I then had the plans mounted to poster-board because it makes it easier to cut out and transfer the outline than using a flimsy piece of paper. I flattened out the curves a lot on the upper and lower back supports as the curves were too extreme for the 3/4 inch thick wood. I also had to adjust the horizontal legs back more on the front legs than the template is marked for because the wood was also 3/4 inch thick. (Reducing the template does not account for the fact the wood still has the same thickness as the full size chair.) The arms were placed with a 3/4" overhang over the front legs. These were all easy changes. I also increased the height of the back pieces by 2" each just because I wanted to have a taller back. If you have a router table, round over all the edges. All pieces can be cut easily from a single 1x10x12. Can you please provide me with the dimensions of the chairs. I cannot open your dimensions file. Can you e-mail it to me as a PDF? I just built two of these. Thanks to the author for providing the plans. After having built 2, I think I can answer a few of the questions as I ran into those same problems. I put my leg intersections about 12.5 inches from the floor. Basically, where the cut pieces will sit parallel with the front of the chair (set back 1/2" for your chair front), is the height you should use. Also, I overhung the chair arms about 2 inches over the legs. This worked well with both my chairs. Another thing to watch for, the initial 3 bolts you put in to hold the legs together, make sure you don't put the bolts too far toward the front, as this will dictate where your arm supports have to be placed (ie, if you put bolts too near the front, your supports will be WAY out and might look a little goofy). Otherwise, this project was really easy. Thanks again for posting it guys. Thanks for the plans, it came out a beatifull chair. Anyway, once I start assembling the chair I notice that there are some small differences between the the project and the photos, nothing to be worried, but there are. Something else, I felt the the back of the chair to inclinated, i uprise it a bit and it come much more confortable, principally to the neck. Anyway that was the best project I found in internet and it will be in garden on my holiday house in bahia state, brazil. Treated lumber is a good low cost material but because of the chemicals sanding is not recommended. Instead stick to the more expensive cedar or red wood. Or you could by untreated lumber with the option to stain, paint, and seal. Thank you so much for these plans. We do have one question. How many inches is the set back of the front leg from the front of the arm? How do I know where on the front leg to screw on the arm? "Screw on arms of chair onto the front legs." Armando, it is already a PDF and shouldn't need any software. The full size file will have to have to be printed on 24″ by 36″ paper at a local copy shop. Many copy shops will allow you to email the file to be printed. At the bottom of the post I have a download for the actual dimensions if you need them. Would you have instructions for a footstool to match? Should be easy.....just want to be sure. Thanks. Will somebody please tell me the dimensions for the chair? I keep checking back every few day's looking for them.It's been three weeks and I still don't see them.I might just be confused about where to look.Help please. You can see the dimensions by clicking on the words that say "Adirondack Chair Dimensions" right above the lowes picture. Don't see the dimensions on the post. Am I blind or is there a secret I'm missing? You can see the dimensions by clicking the words that say "Adirondack Chair Dimensions" right above the Lowes picture. Just wanted to say thanks for a great set of plans and directions. Honestly, the comments on this site - so many ungrateful, selfish people. Like "I'd hate to rush you but I am running out of time...". What a moronic thing to write. People, be grateful you're getting something for free. Or maybe stop being such cheapskates and actually pay for plans if you're that desperate or in a hurry. I'd hate to rush you but I am running out of time to make these chairs! Please figure out the dimensions I would really appreciate it. My husband just completed his first one (of many, I hope!) tonight and it looks great. Thanks for posting this easy template and instructions. Cindy - Thanks a great deal for these plans. I sent the pdf to Office Depot and had them printed on 24"x36" sheets - it only cost $5.88. I am looking forward to getting started! Thanks again. The dimensions have now been added to the post! Thanks so much for reading Skip to my Lou! Sorry for the delay, but the dimensions have been added to the post. We did our best to recreate them from the template. Really though, everyone the easiest thing to do is print of the template and trace around it, no measuring needed. Thanks everyone for reading my blog! Amazing chair, I would also like to build one this weekend! Have you had any luck with the dimensions yet? I'd love to work on this tomorrow. It is Saturday. Do you have the dimensions up somewhere? I will try to make a pair of these, and are therefore, as well as others, waiting for the dimensions. I live in Denmark so metric dimensions would be perfect if possible. 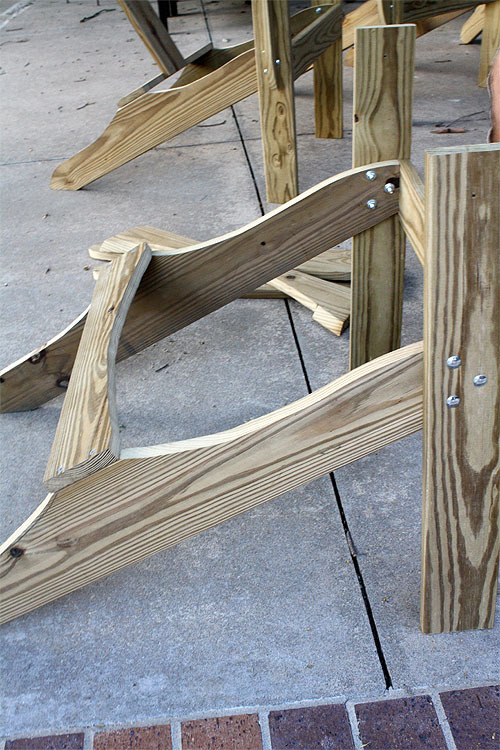 I decided i am going to make an Adirondack chair and after a bit of research,I found your blog. That is the nicest I have seen so far. I especially like the back rest because it does not look as if its a circular shape cut out as an afterthought. I have downloaded your template and will attempt this without sizes,Am I being foolish? Should I wait for the new improved version? I don't understand last post. I plan on building the chair, but why do I need dimensions if I have templates to print off and follow? Definitely agree that we need dimensions to make the templates to cut these pieces. Love the chairs but without specific dimensions the plans are useless. Please email us when you post them. Russ, we will try to get the dimension up by Saturday. Do you have the Dimensions yet for this plan? Bob, we are working on the exact dimensions. I am building these chairs in my basement work shop. I was wondering what the overall size is of the chairs? I don't want to get it made and not be able to get it out of the door. What is the total width ? Deron if you can give us to Saturday. We will get the dimensions up. I thought it was easiest to just print a template...I was wrong and will update the post with exact measurements. I really like the plans, but need a way to transfer dimensions from an 8.5x11 sheet of paper. Do you have a set of plans with dimensions on it? Daniel, we are working on this. I thought it would be easier if everyone could print the pieces out to scale....I was wrong. Hang tight we will try to get this done as quickly as possible! For anyone who has built these chairs: when you had the templates printed, what did the dimensions come out to be? Ex. Dimensions of the center back slat? Hi C, we are working on plans with dimensions. So sorry everyone for the confusion! Thank you so much for this great posting! I've been searching online for just this kind of template. I moved to mexico two years ago, and my adirondack chairs were left actually back in the adirondacks in storage, and I've missed having them. So now I can make my own here!! Debi, I used 1x4's and 1x6's pressure treated lumber from lowes as the lenght sizes from material list above. and a box of deck screws and hex head bolts,nuts, and washers. All came up to around $35-$40 bucks plus tax. Depends on your location--I have found that Lowes charges different prices from different locations. Im on GA and AL line and between the two states there was about a five to ten dollars difference. It also depends on the type wood you use, If you plan on painting or staining the wood the pine wood (untreated) should be cheaper than treated wood. but also concider your cost on paint too. Interesting that the people who actually built the chair and supplied the photos and the plans never respond to questions about the project. Not sure why Staples couldn't print the file for you. That's where I had it done. Got 2 pages printed out on their wide format printer. I had the graphic mounted and laminated on foam core board and used a razor knife to cut the templates, which I transferred to the wood. I would assume all Staples copy and print centers have the same equipment. Just left Staples and they could not print the plans to "full size" on 24 x36 " paper. It looks more like a child size chair. Does anyone have the actual dimensions of each piece. FYI to the inquiries of printing out the templates to the actual sizing of the boards ... I ran into this issue to of not having a printing store local to print this out for me. not sure if you all are able to do this but maybe you can, I printed mine off at work using 8.5"x 14" legal size paper(can be done on 8.5x11 paper but uses more pages). when you are ready to print out the template from computer, I was able to change the page set-up under "page sizing and handling" select "Poster" and then print. this will print the correct size of template onto several pages and I cut out the templates and taped or pieced together the cut-outs . Hope this will help some or all. Click the link and it opens a pdf file with the drawings. Save the file to a flash drive, take it to Staples copy and print center and tell them to print it full size. You'll get 2 pages of plans you can cut out, lay on the wood and trace. 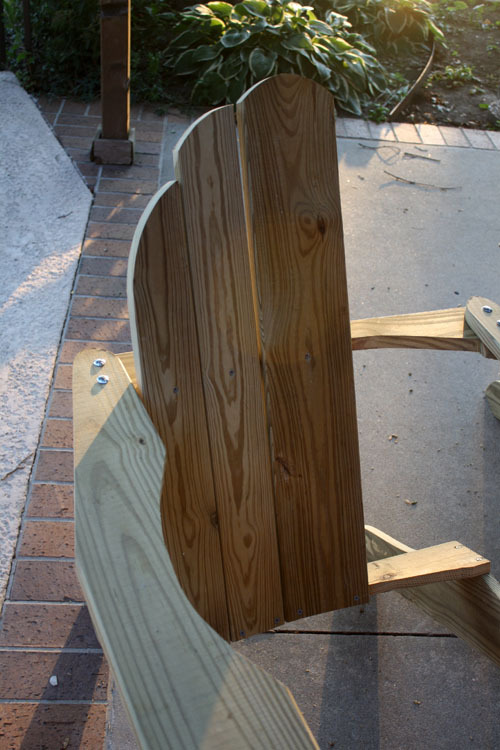 how do I get the templates for this Adirondack chair? You can feel free to call me on my cell for this @ 361-446-2757. Good question, Dan. It should have been addressed by now but it wasn't. I didn't run into that issue until I started building, and then realized there were no bolt hole markers on the back piece and no dimension give for the overhang of the arms. I went with 2" over hang measured from the front of the vertical front leg. Keep in mind more or less overhang ultimately determines the comfort of the chair back. Too much overhang and you're sitting up straight. Too little and you're lounging. Good luck. how much overhang on the front arms? where do you place the bolt holes for the front and back of the arms? Guys, if you download the plans as the pdf file, then copy the file to a flash drive or email it directly to your nearest Staples copy and print center, they will print the plans full scale. I had them print, laminate and mount them to foam core so I could cut out each piece and save the template for future chair projects. They print full size, so you just trace and cut the material. There are several choices of wood for the project, Redwood and Teak are both good for their ability to withstand the outdoors and won't rot or get attacked by termites. Pressure treated lumber is fine (cheaper) but usually requires some re-staining or re-treating every couple years. Don't use oak. It splits in dry weather and turns black in the sun if left untreated. pine or yellow pine is okay if you want to paint the chair. You can't leave it untreated because it does not respond well to weather. I used Cyprus which has great workability with saw, sander and router, if extremely outdoor friendly and requires almost no upkeep. A light coat of food-safe oil is all that's needed to keep it great looking for years. Tools required are minimal, although they should be capable of doing the job. Table saw, power miter, band saw, spindle sander, router, and drill press are the ideal. 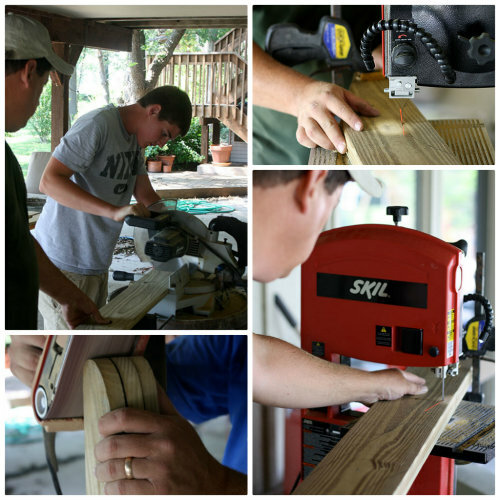 In lieu of the above, a circular saw can replace the table saw, a portable sander replaces the spindle sander, a jig saw replaces the band saw and a sanding block and sheet sandpaper replaces the router. A cordless drill replaces the drill press. Keep in mind, the chair will not look as professional or as clean using the replacements, nor will it be as easy to build. Nothing rips straight and true as a table saw and nothing makes rounded edges like a router. Nothing cuts curves like a band saw. That being said, with some extra time and a slower pace invested in the project, you can make it almost as good as what is shown. 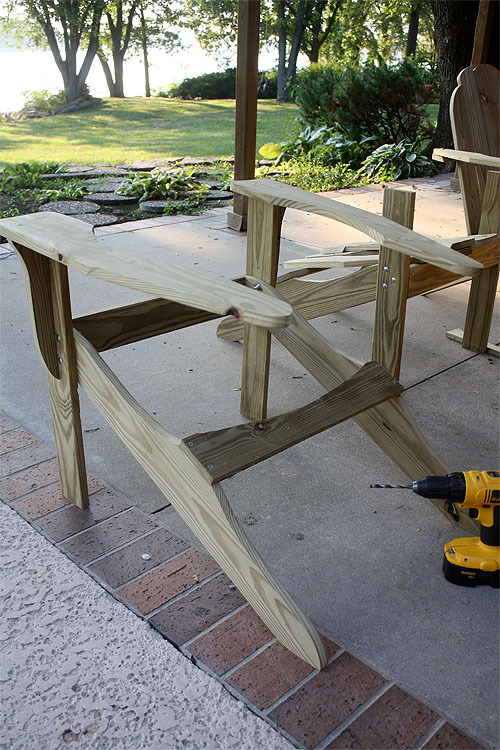 Extra Note: Use stainless steel or galvanized screws and carriage bolts. Spend the extra money. It's worth it. Next year when you're looking at all the rust streaks coming from the screw holes, you'll understand why. I made a chair with your plans; it turned out great. I need to make one more! Do have a plan for a stool to go with it? Thanks again! "x36"make the board widths 6" wide and 4" wide however when buying lumber when you buy 1" x 6" boards you are actually getting 3/4" x 51/2 ". Question. Do we scale the print down to actual size of boards one is able to buy? And if so would we need to get 5/4" thickness to get the actual wanted thickness of 1"? My husband made these chairs and we love them. Wanting to make some kid ones. Anyone know the scale conversion to print? hi the plans are great but I have one question on the arm there are only the holes for the back of the arm. where do you set them to drill thank you. Nice project, but please wear a dust mask when cutting, drilling and sanding treated lumber, especially when children are involved. Thanks Roger for the tip! What is the secret to enlarging the plan drawings so that I may trace and then cut out? Looks like a great project for my new shop. Good design, and it looks well built and engineered. Another option for a folding chair with templates. I built one of these over the last 2 days and I like the way everything has turned out. I'd love a copy of the plans with the radii of all the curves listed. Thanks for the plans/template!!! Working on them now. The 30 degree cut was a pain but I managed it with a jig saw(no band saw). I had to go to fed/ex kinkos to have the templates printed. Caitlin I would have sent you my templates but I didn't see your post and I threw them out after making wood templates for later use. Did you try print shops in your area? I plan on making a set of these chairs for Christmas gifts, but no where in my area is able to print these templates for me especially to still have time to make them before Christmas. I already purchased the lumber for the project. Wondering if someone who has already made these would be ever so kind to send me there template for the chairs and I would send them back after I'm done. Hey guys just wanted to ask how i would be able to print the plans to scale so I can build the chair. I saved the plans but it fits it to one 8.5 X 11 sheet of paper. any help is greatly appreciated. Look for something called IPE. Its a little harder to work with but will last forever. I am wondering what type of wood you used for this? I have used oak previously and painted them, but this time around I am going to keep the natural wood look and want something with a good grain like the pieces you used. My honey-do list is just getting longer now that I've seen these!! Ok, My hubby is saying that he's not sure you can use a circular saw to make the curved cut (like for the rounded section on the back support)... Is there something special that needs to be done??? Hi Teresa, I just asked my husband and he said he used a band saw with a 30 degree setting on the tilt table. Seriously impressed!! I wish I had a husband who was into wood-working, or would take the time to teach the kids. Hopefully in the next few years. Then the boys can build me a chair like this! Thanks for the plans! Will save for later. They love wonderful. And what a lovely setting. I pinned it to my How To's. What a precious thing you have done for all of us who would like to make these ourselves. You went to a lot of trouble and we thank you..... a lot! Amazing chairs! Love to see the family working together. I love the picture of you all facing the lake!!! Hi to all. This is great, I'm going to pin it! The chairs look so comfortable. That is a great improvement to any back yard or deck. Beautiful! You all did such a great job!